Touchdown of Hayabusa2 mothership has been postponed because of unexpectedly rough terrain. 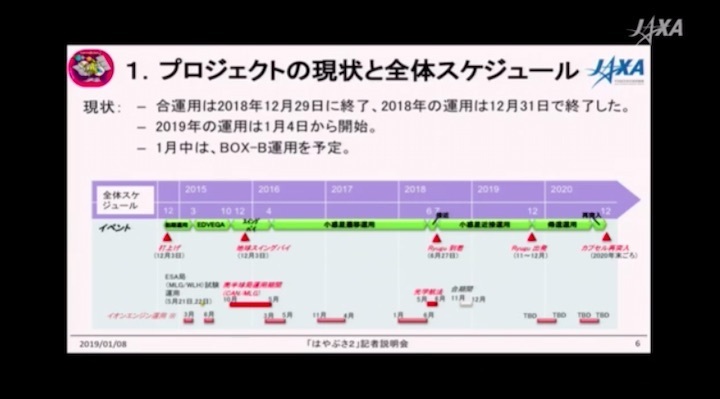 The mothership of the Japanese probe Hayabusa2 will make its first touchdown on the Ryugu asteroid in January, instead of this month as originally planned. 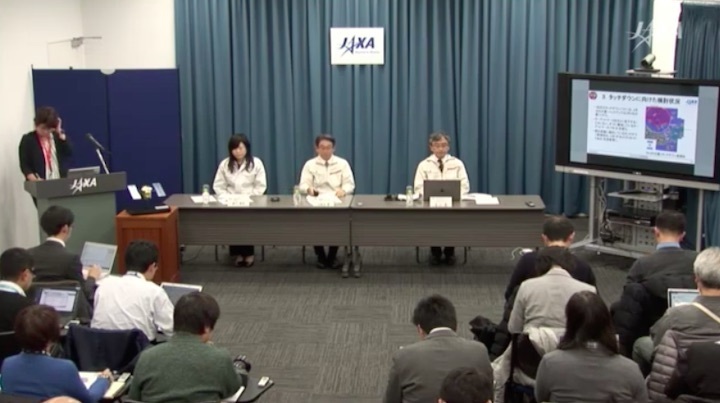 The Japan Aerospace Exploration Agency’s mission team has determined that the asteroid’s surface is rougher than expected and has decided to take more time to plan the landing, according to a statement JAXA published on 14 October. This part of the mission — which will collect a sample of the asteroid to be brought back to Earth — is the most important, but also the riskiest. 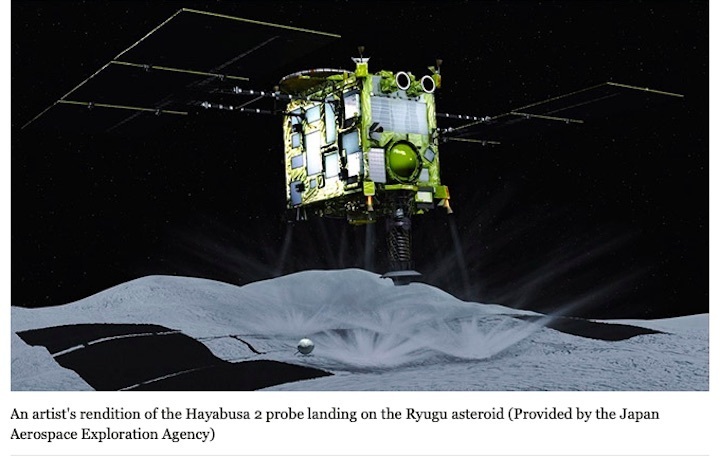 Hayabusa2, which also carries several smaller probes, launched in late 2014 and reached Ryugu in June of this year, aiming to return samples of the space rock’s surface to Earth by 2020. Hayabusa2 is hovering over the space rock at varying altitudes, countering the gentle gravitational attraction with its ion thrusters, as the 1-kilometre-wide Ryugu rotates underneath it once every 7.5 hours. In late September and early October, the spacecraft descended to altitudes of a few tens of metres to deploy three small landers, which have sent back images and data from the surface. For the sample-collection phase, the project team had been hoping to identify a region at least 100 metres wide that would be relatively boulder-free — meaning without rocks higher than 50 centimetres. Otherwise, higher boulders might strike the main body of the craft as it deploys its 1-metre arm to collect a sample, a JAXA statement says. But detailed maps of the surface have shown that the best such area is only about 20 metres wide. The agency now wants to make sure that it can hit such a narrow target on the rotating surface. 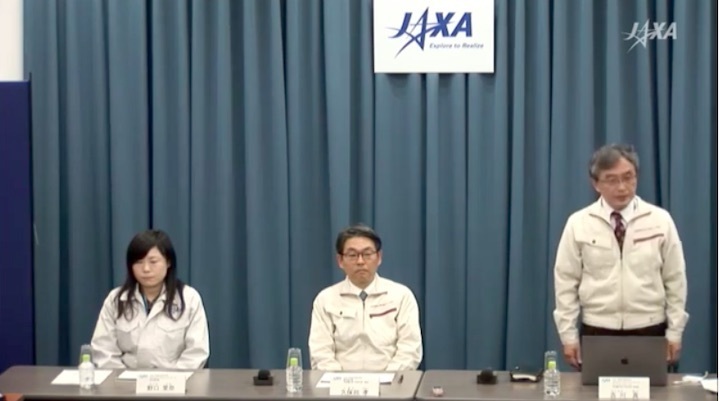 JAXA says they will be performing a touchdown rehearsal from 14-16 October, lowering the craft to an altitude of about 25 metres — the lowest to date — to test the probe’s altitude measurements at short distances. 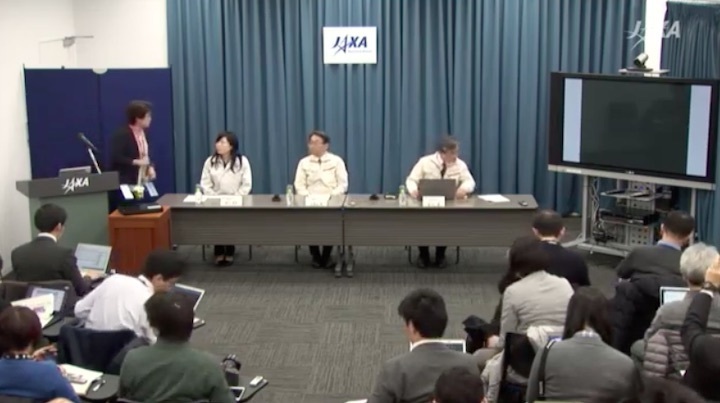 “Although the spacecraft can be controlled with a position error of 10 m at an altitude down to 50 m, there remains the question of whether this accuracy can be retained as the spacecraft descends to the surface,” the JAXA statement says. 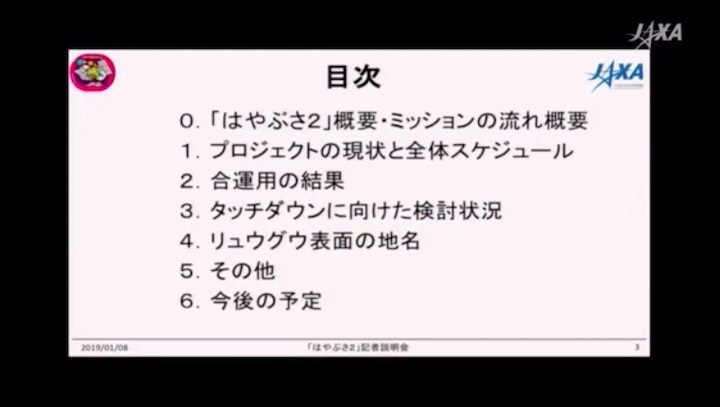 This is what the mission team will try to establish in the next months. 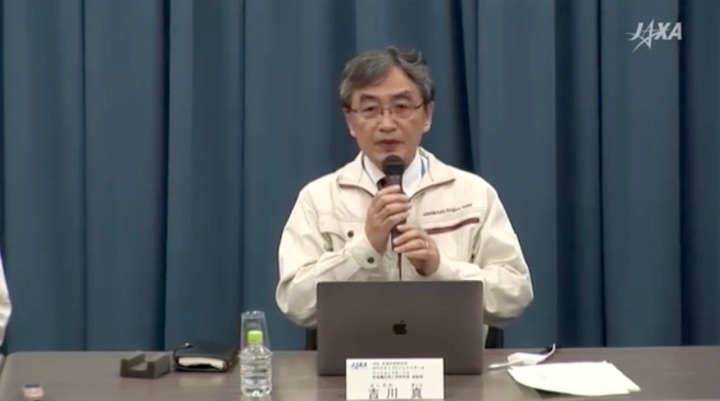 The postponement will not affect the schedule for the sample return, which is still planned for 2020, mission manager Makoto Yoshikawa at JAXA’s Institute of Space and Astronautical Science in Sagamihara told Nature. 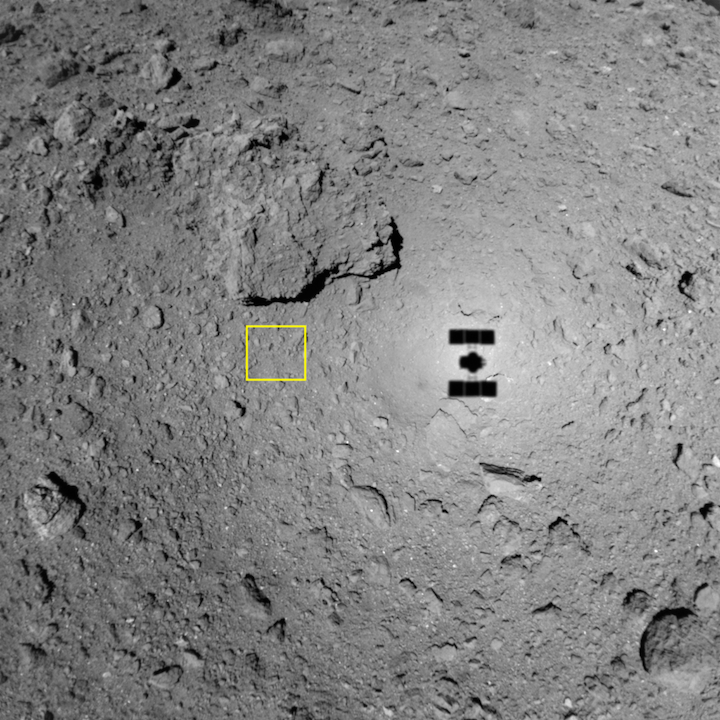 Den Weg, den MASCOT auf der Oberfläche von Ryugu zurücklegte, konnten die Wissenschaftler nun anhand von der Bildern und Daten der Muttersonde Hayabusa2 sowie des Landers nachvollziehen. Noch nie zuvor in der Geschichte der Raumfahrt wurde ein Körper des Sonnensystems auf diese Art und Weise erforscht. Sechs Minuten freier Fall, sanfter Aufprall auf einem Stein und dann elf Minuten wiederholtes abprallen bis zur ersten Ruhelage. So begann die Reise des Asteroidenlanders MASCOT am frühen Morgen des 3. Oktober 2018 auf Asteroid Ryugu, einem Land voller Überraschungen, Geheimnissen und Herausforderungen. Nach diesem ersten Weg auf dem knapp 900 Meter großen Asteroiden folgten rund 17 Stunden intensiver wissenschaftlicher Erkundung. Hierzu wurde die Landesonde vom MASCOT-Kontrollraum am Deutschen Zentrum für Luft- und Raumfahrt (DLR) in Köln in Anwesenheit von Wissenschaftlerteams aus Deutschland, Frankreich und Japan kommandiert und gesteuert. MASCOT übertraf alle Erwartungen und führte seine vier Experimente an mehreren Stellen auf dem Asteroiden aus. Noch nie zuvor in der Geschichte der Raumfahrt wurde ein Körper des Sonnensystems auf diese Art und Weise erforscht. 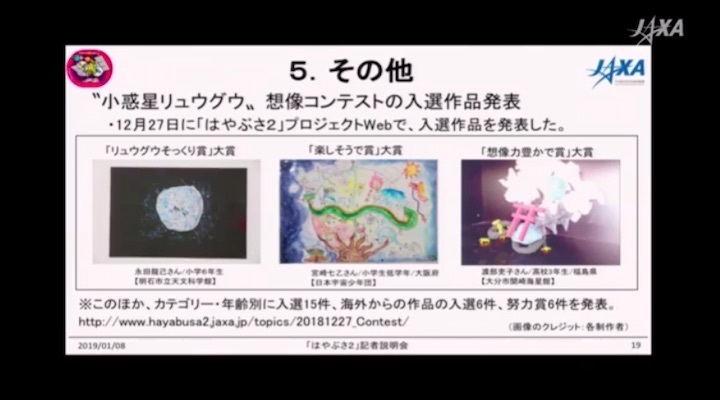 Der Weg, den MASCOT dabei auf der Oberfläche zurücklegte, konnte nun anhand von Bilddaten der japanischen Sonde Hayabusa2 sowie der Bilder und Daten von MASCOT genau nachvollzogen werden. 03:57:21 MASCOT wird in einer Höhe von 51 Metern über Ryugu von einem Bolzen hinter einer Abstoßplatte aus seiner Ladebucht in der Raumsonde Hayabusa2 mit ca. 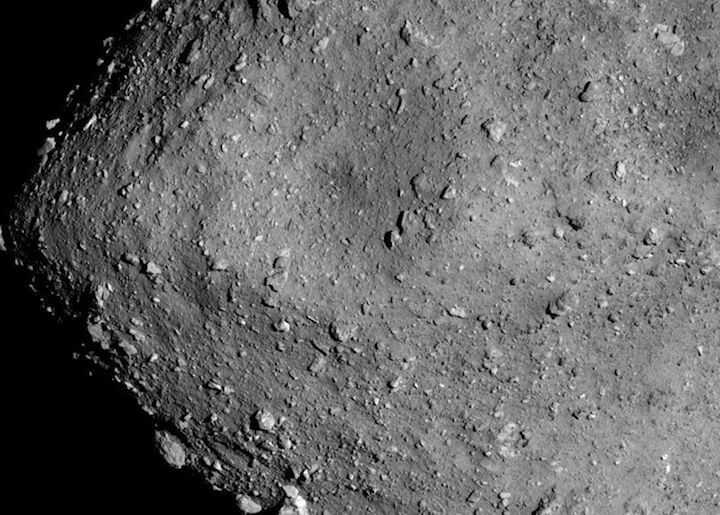 4 Zentimetern pro Sekunde geschoben und schwebt antriebslos und ohne Kontrolle der Bodenstationen auf Ryugu zu. 04:03 Nach ca. 6 Minuten hat MASCOT mit einem etwa 3-4 Meter großen Steinblock einen ersten Bodenkontakt mit Ryugu. Die Optical Navigation Camera (ONC) von Hayabusa2 hält den Ablauf in hochauflösenden Bildern fest. Gleichzeitig nimmt die DLR-Kamera MASCAM den Asteroiden während des Abstiegs in 20 Bilder auf. Das festgelegte Landegebiet MA9 (= "Alice’s Wunderland") wird genau getroffen und befindet sich etwa bei 300 Grad östlicher Länge und 30 Grad südlicher Breite. um ca. 04:34 am 1. Standort Nach weiteren ca. 31 Minuten und mehreren Bodenkontakten hat MASCOT seine erste Ruheposition erreicht. Auf dem Asteroiden herrscht an der Landestelle Tag und die Surface Messungen starten. ca. 06:30 Im DLR-Kontrollzentrum in Köln wird erkannt, dass MASCOT auf dem Rücken liegt und so seine geplanten Experimente nicht durchführen kann. Alle Systeme und Experimente arbeiten wie vorgesehen. ca. 09:20 Von der Erde wird außerplanmäßig ein Kommando an Hayabusa2 und von dort zu MASCOT gesendet, den Schwungarm zu aktivieren, um den Lander in seine für die Experimente vorgesehene Position zu drehen. Die Laufzeit zur etwa 300 Millionen Kilometer entfernten Mission beträgt ungefähr 18 Minuten für die einfache Strecke. ca. 09:52 MASCOT hat seinen ersten Tag-und-Nacht-Zyklus hinter sich. Der zweite Tag auf Ryugu beginnt. um ca. 10:30 am 2. Standort Das Manöver hat das gewünschte Ergebnis gebracht. MASCOT liegt in der richtigen Lage, ist nun einsatzfähig und beginnt automatisch wieder seine vier Experimente durchzuführen. ca. 12:51 Die zweite Tageslichtphase auf Ryugu geht langsam zu Ende und MASCOT rotiert mit Ryugu in seine zweite Nacht. ca. 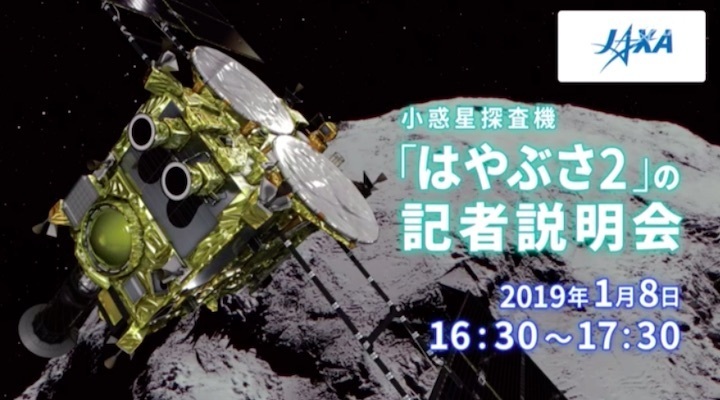 17:28 Für MASCOT beginnt der dritte Tag auf Ryugu. um ca. 18:29 am 3. Standort MASCOT führt erfolgreich einen "Mini-Move" aus. Dieses Manöver wurde vom Operationsteam in Köln kommandiert, um die Lage der Sensoren der Experimente zu optimieren. Weitere wissenschaftliche Untersuchungen erfolgen. um ca. 20:04 am 4. Standort Der letzte Sprung wurde an MASCOT kommandiert und der Lander begibt sich in die "End of Life"-Phase. Weitere wissenschaftliche Untersuchungen werden durchgeführt. 21:04 Es naht das Ende des dritten Tages für MASCOT auf Ryugu. Inzwischen sind mehr als 16 Stunden vergangen - die erwartete maximale Laufzeit der Batterie in MASCOT. Entgegen der Berechnungen liefert die Batterie immer noch etwas Strom bevor der Kontakt mit MASCOT durch den Eintritt eines Funkschattens und die bevorstehende Nacht abbricht. Statt 16 Stunden konnten die Experimente 17 Stunden und 7 Minuten lang arbeiten. [TD1-R3] Today we begin our descent for the 3rd touchdown rehearsal! 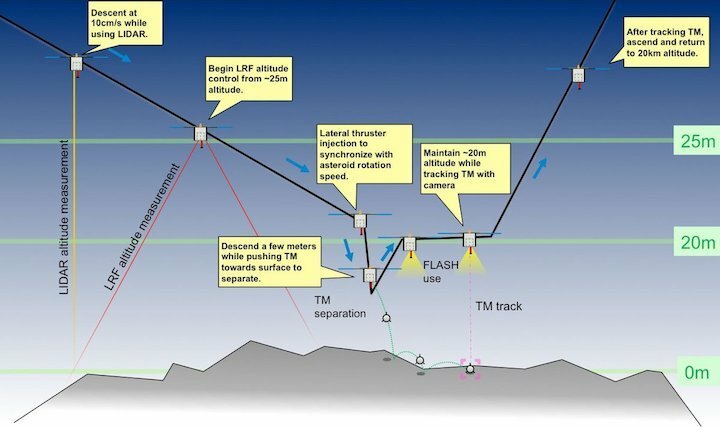 Goal is to confirm the accuracy of navigation control at low altitude via: ・Altitude measurement & spacecraft control by LRF (Laser Range Finder). ・If OK, Target Marker (TM) separation. ・Tracking of TM. [TD1-R3] Real-time delivery of the navigation images has ended —thank you for following! This image was taken on 10/25 at 14:15 JST received at the end of delivery. 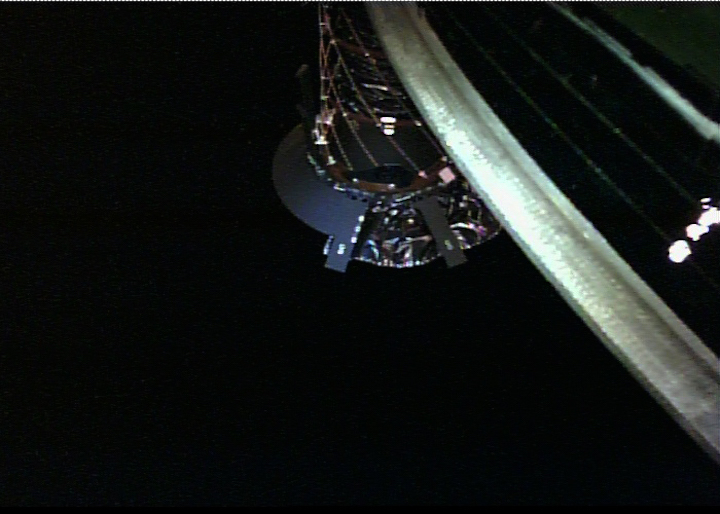 Due to the camera settings, it is darker than during descent, so we added an image with adjusted brightness. 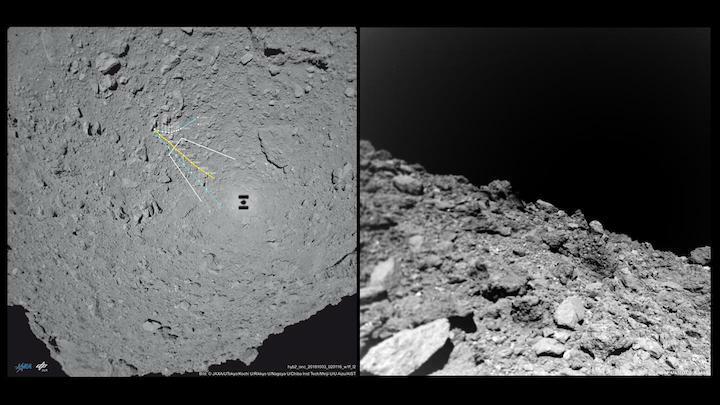 Approximately one month has passed since the laser altimeter (LIDAR) onboard Hayabusa2 measured the distance to asteroid Ryugu for the first time. 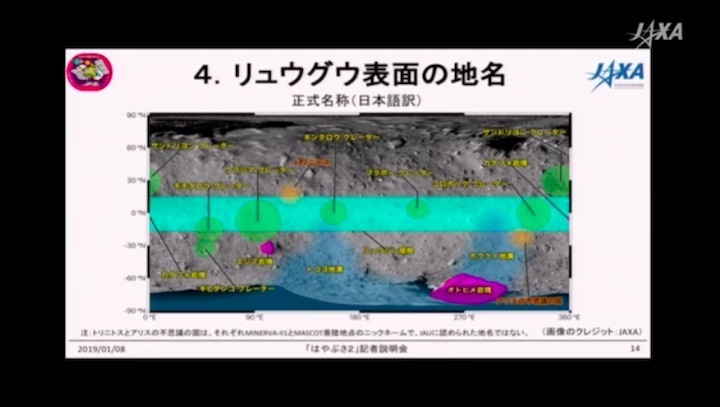 The figure below shows the analysis of the data acquired during this period, with each point showing where the laser reflected from the surface of Ryugu. Normally, the attitude of the spacecraft is controlled so that that the laser altimeter faces the equator. But during this operation, the attitude was changed to move along the asteroid’s axis of rotation; this is an “attitude scan” that has been performed twice so far. In the vicinity of the poles, there are currently fewer data points, but you can see the global shape of Ryugu. In order to construct this shape, the orbit of the spacecraft must be accurately predicted. The accuracy is currently several hundred meters. That the position of a spacecraft 300 million km away from Earth can be determined to within hundreds of meters is impressive, but this error is still too big to describe the shape of the 900m diameter Ryugu [*]. We are therefore improving the trajectory of the spacecraft using the distance measurement data from the laser altimeter. 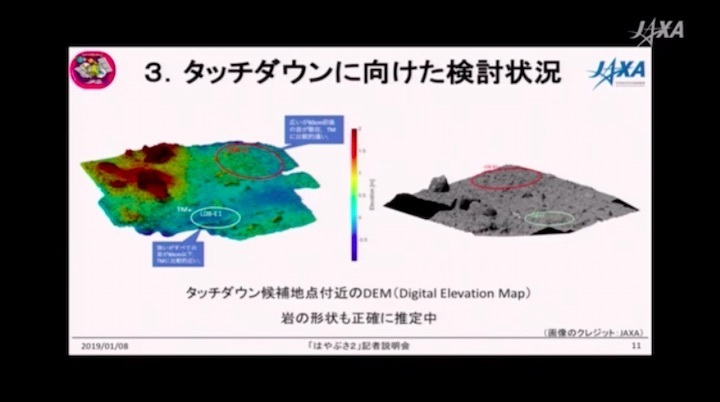 The improved orbital data of the spacecraft also aids the other equipment teams on Hayabusa2 and is being used to select the best landing site. 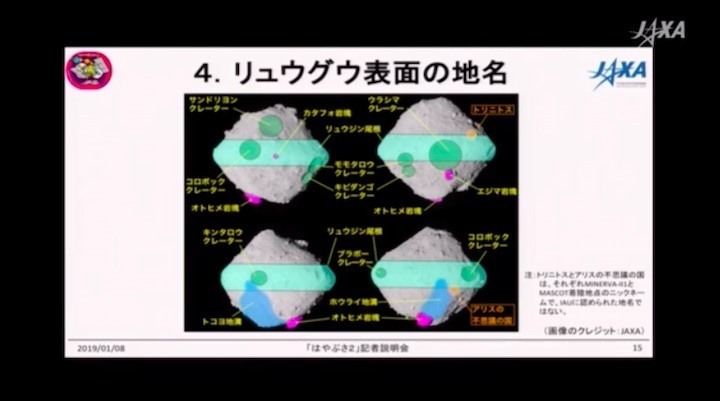 [*] To create the figure below from the LIDAR data, we used the shape model of Ryugu to guide the three-dimensional structure. (Image credit: National Astronomical Observatory of Japan (NAOJ), JAXA, Chiba Institute of Technology, University of Aizu, Nihon University, Osaka University). Onboard Hayabusa2 is a Small Monitor Camera (CAM-H, also called the Small Monitor Camera Head), which was funded by contributions from the public (Figure 1). Figure 2: The sampler horn on Hayabusa2 captured with the Small Monitor Camera on August 14, 2018. Image credit: JAXA. From this photograph, we can perform a visual inspection of the sampler horn and confirm it is sound after Hayabusa2 has arrived at Ryugu. It will soon by time for the sampler horn’s role! In connection with the sampler horn, we also tested a laser device called the LRF-S2 in April this year. LRF-S2 is designed to measure the distance to the tip of the sampler horn. During touchdown, the sampler horn will compress as it touches the surface of Ryugu. When the distance measurement from LRF-S2 changes or the laser from LRF-S2 deviates from its target at the base of the sampler horn, bullets will be fired to stir up the surface material for collection. This makes the LRF-S2 an important device for successful sample collection. The photograph captured during this test is shown in Figure 3. Figure 3: Test photograph of the sampler horn taken by the Small Monitor Camera (CAM-H) on April 16, 2018. The shiny part in the red circle is the target plate of the sampler horn which is irritated with the LRF-S2 laser. If the laser misses this plate, touchdown is in process and bullets will fire to stir up surface material. Image credit: JAXA. You can see the LRF-S2 laser beam is properly hitting the tip of the sampler horn, and is ready for touchdown operations. Incidentally, this next image in Figure 4 is the sampler horn captured by CAM-H on December 5, 2014 (two days after the launch of Hayabusa2). Figure 4: The sampler horn imaged by the Small Monitor Camera (CAM-H) on December 5, 2014. Image credit: JAXA. Figure 4 is the sampler horn three years and nine months ago, but everything looks the same as in Figures 2 and 3. The color of the sampler horn tip only appears to be different in Figures 2 and 3 due to the Sun’s light. We would like to thank everyone who made a donation for this camera! The second touchdown rehearsal (TD1-R1-A) was performed from October 14 to 16. On October 15, just before 22:44 JST when the spacecraft reached a new low altitude of 22.3m, we successfully photographed the surface of Ryugu using the Optical Navigation Camera – Telescopic (ONC-T). This is the highest resolution image to date (Figure 1). Figure 1: The surface of Ryugu photographed on October 15 at 22:40 JST using the Optical Navigation Camera – Telescopic (ONC-T). The altitude here is about 42m. The image resolution is about 4.6mm/pixel. This is the highest resolution image that Hayabusa2 has taken so far and even small rocks with a diameter of 2 – 3cm are clearly visible. The maximum resolution of AMICA –the camera at the time of the first Hayabusa mission— was 6 mm/pixel, so even its resolution has now been exceeded. As the image captured of the asteroid surface from the spacecraft, it will be one of the highest resolution to be taken of Ryugu (MINERVA-II1 and MASCOT which landed on the surface, have captured even higher resolution images). A feature from the image is the lack of regolith (sandy substance). This was suspected to be true from the images obtained so far, but it is more clearly seen in this high resolution photograph. There is also a collection of pebbles with different colors, which may be evidence that the surface material of Ryugu is mixed. It is a landmark for the mission that such high resolution images were captured by the spacecraft before landing. Such a detailed image that can be used to visually recognize anything above about 1cm in size is extremely useful in analyzing the surface photographs returned from the MINERVA-II1 rovers and MASCOT lander and also for understanding the microanalysis from the sample once it is returned to Earth. Note: the image area in Figure 1 is shown in the yellow box. 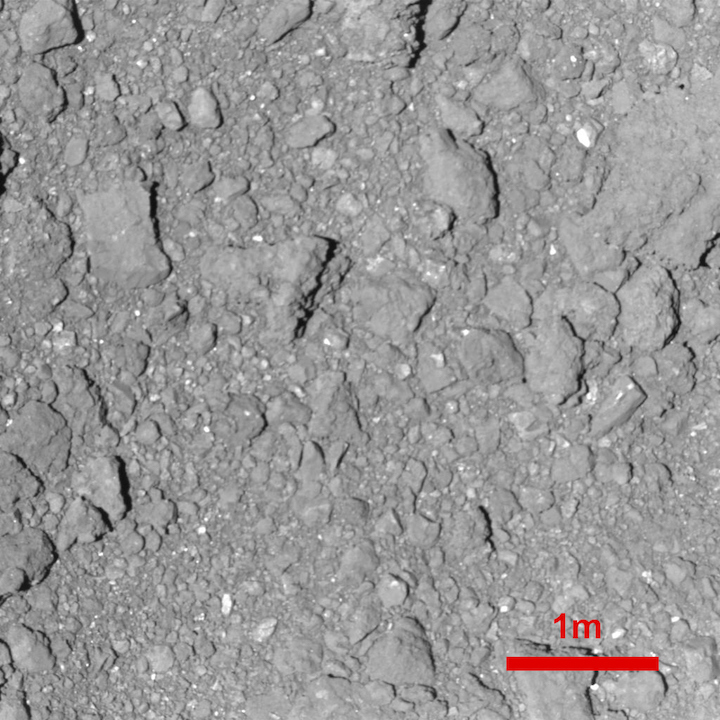 Figure 2: Surface of Ryugu photographed by the ONC-W1 at an altitude of about 49m. The image was captured on October 15, 2018 at 22:39 JST. The yellow square indicates the image area in Figure 1. 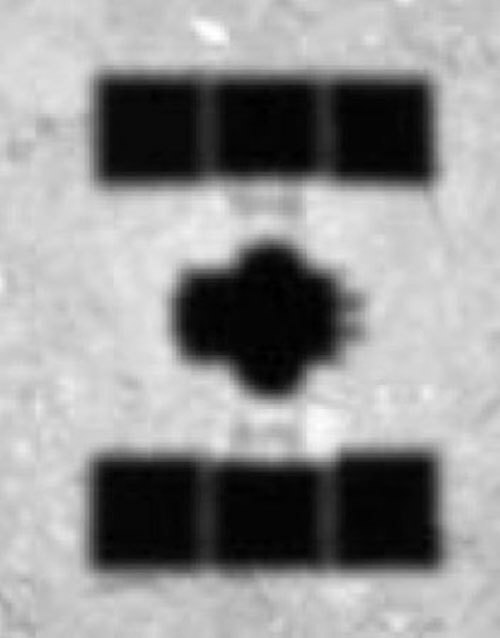 During the second touchdown rehearsal (TD1-R1-A), we captured a sequential set of images as the spacecraft reached the point of lowest altitude and then began to rise (Figure 1). The spacecraft reached the lowest altitude of 22.3m above the surface of Ryugu on October 15, 2018 at 22:44 JST. 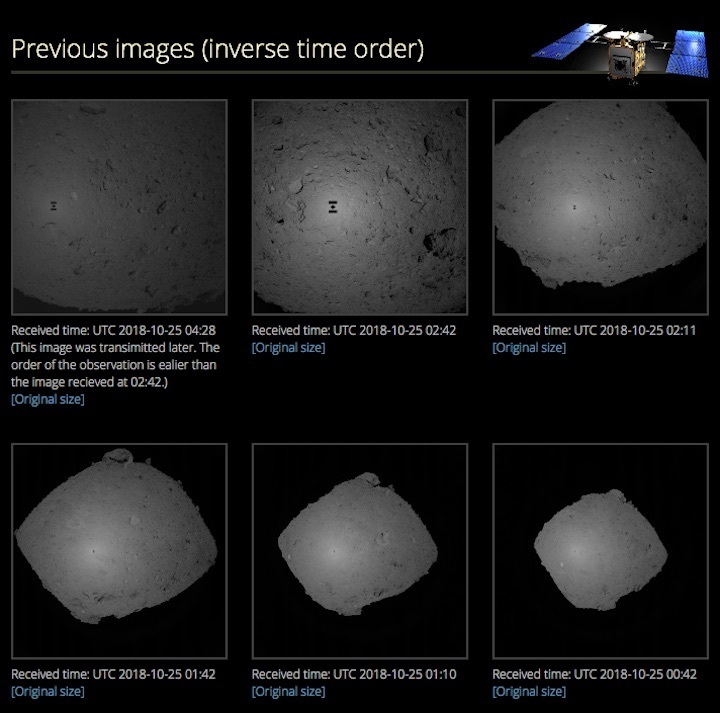 [open in another window] (mp4, 3.5MB) (Animated GIF, 38MB) Figure 1: Sequential images of Ryugu captured by the Optical Navigation Camera – Wide angle (ONC-W1). The images were taken on October 15, 2018 between 22:45 ~ 22:53 JST. 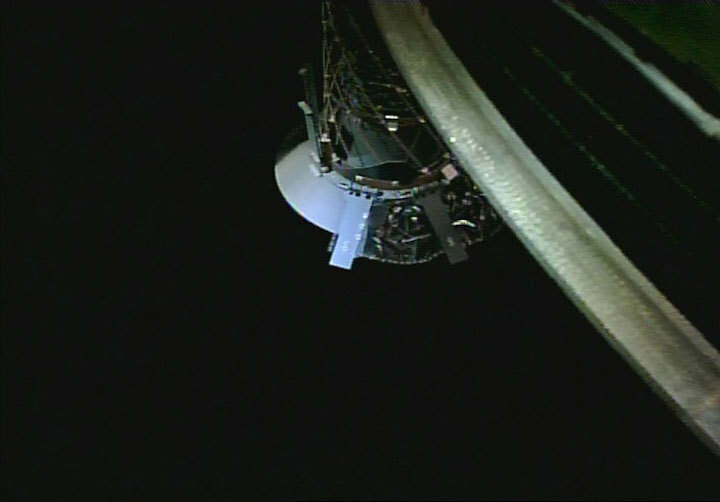 The altitude of the spacecraft when the first image was taken is about 240m, the lowest altitude image is at about 47m at 22:45 JST and the altitude in the final image is about 370m. 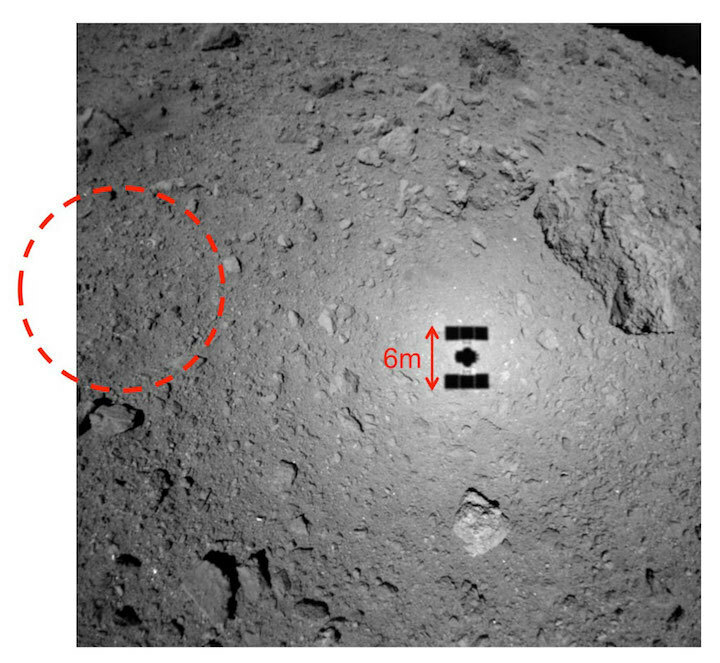 Figure 2: Image of the surface of Ryugu captured with the ONC-W1 at an altitude of about 47m. The image was taken on October 15, 2018 at 22:45 JST. The red circle indicates the candidate point for touchdown, L08-B. Figure 3: Enlargement of the shadow of the spacecraft. Making maximum use of the data obtained during TD1-R1-A, the TD1-R3 operation ran from October 23 - 25. This was a rehearsal that covered the operation sequence until the point just before touchdown. The spacecraft descended to the same region at TD1-R1-A using the LRF (Laser Range Finder); a short-range laser sensors with four beams that measures the distance to the asteroid surface. 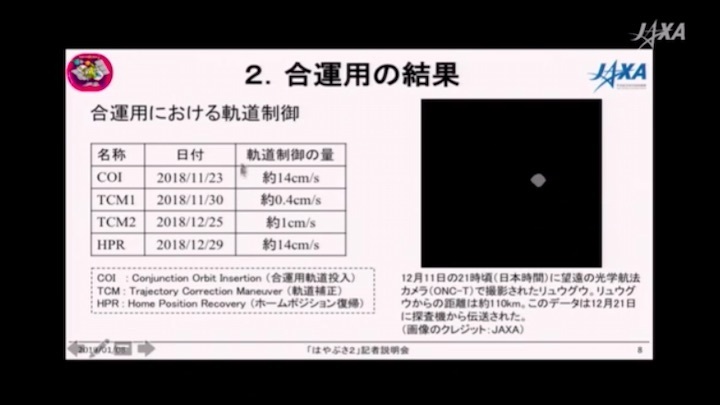 Using this measurement, the spacecraft automatically kept the altitude constant and hovered above Ryugu, and then dropped a TM (Target Marker). The spacecraft was able to recognise the image of the TM when lit by the FLA strobe light (FLAsh lamp), moving to just above the TM position and continuing to hover. Finally the spacecraft ascended. This result was a huge success! Everyone is feeling relieved as we move into next year. During the operation for Touchdown 1 Rehearsal 3 (TD1-R3), we attempted to capture images using CAM-H (small monitor camera) as the spacecraft approached the surface of Ryugu. 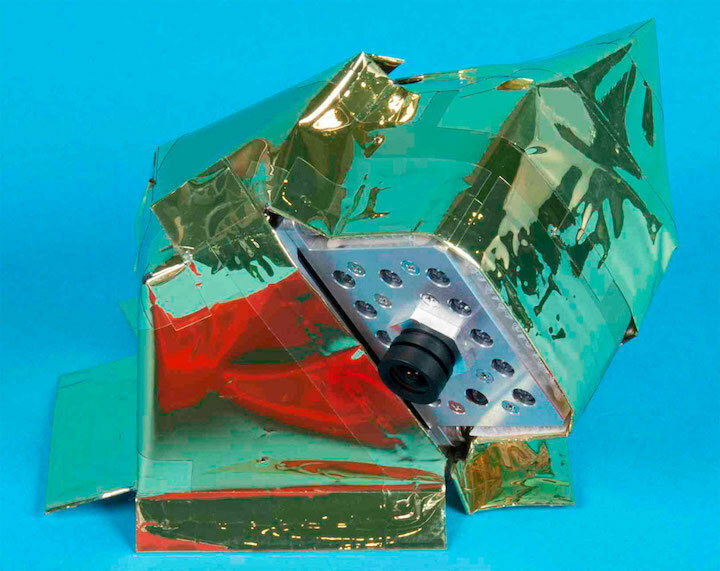 CAM-H was manufactured and installed on Hayabusa2 by donations received from the general public and it is attached near the lower edge of the side of the spacecraft. The camera can photograph the tip of the sampler horn, but it can also capture the surrounding area and background. Figure 1 shows the images taken with CAM-H during TD1-R3. Figure 1: Images taken with the small monitor camera (CAM-H) during the Touchdown 1 Rehearsal 3 operation (TD1-R3). One image was captured every second from immediately after the spacecraft began to ascend (altitude 21m) on October 25, 2018 at 11:47 JST. The spacecraft was rising at about 52cm/s. 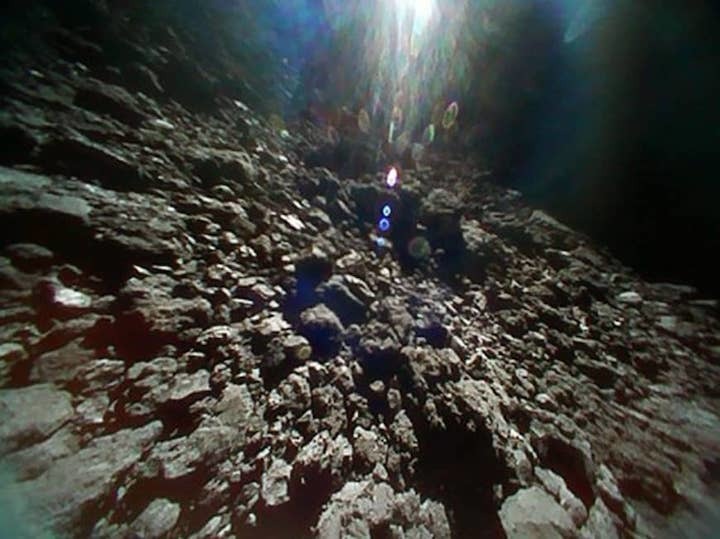 In Figure 1, the camera has captured the sampler horn with the surface of Ryugu receding in the background where the shadow of the spacecraft can be clearly seen. CAM-H is ready for the touchdown operation! We were able to take a really good image! While the image data was being sent from the spacecraft to the ground, my heart was pounding as I wondered what kind of image was on its way and I was very happy to see the image of the horn in the direction of Ryugu. 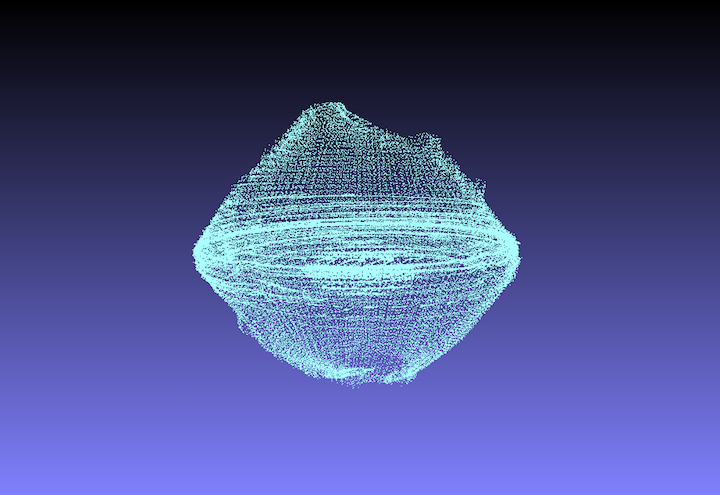 In the connected images collected every second, you can feel the spacecraft rise. I hope that everyone who supported us will be pleased as well. As the person in charge of both the sampler and CAM-H, this was a good rehearsal for the actual touchdown. 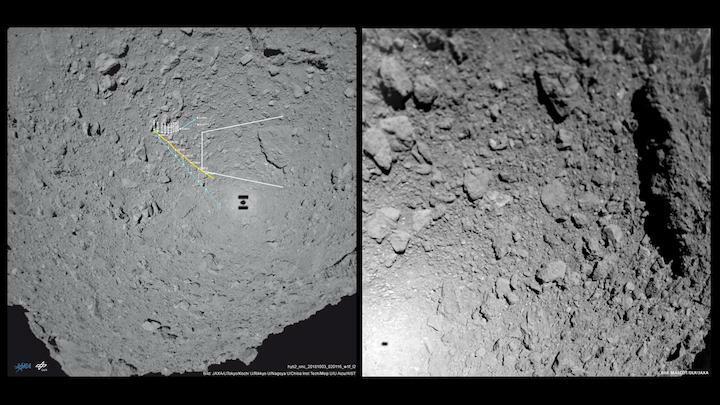 The real pleasure of CAM-H is that it is possible to shoot at this dynamical angle as Hayabusa2 moves away from Ryugu. This camera was realized by everyone’s support and has added great appeal to the technology and science of the exploration of Ryugu. I would like to thank everyone who donated once again and I think we will use this camera more and more in future operations. I never thought we could take images with CAM-H that appear as if we ourselves are flying over Ryugu at low altitude. The pictures look as if they are taken flying somewhere above the desert, but these are actually over a small asteroid 300 million km away. Thank you very much to everyone who supported installing such a camera. Our second “BOX-C” operation began on 10/27, immediately after returning to the 20km altitude home position from the “TD1-R3” operation. This time was a special operation in two steps; BOX-C1 where the spacecraft descended to an altitude of about 5.1km and BOX-C2, with descent to about 2.2 km. Arrival at BOX-C1 occurred as scheduled on 10/30 and we completed observations using the laser altimeter and optical cameras. We arrived at BOX-C2 on 11/1 with the objective of photographing the TM (Target Marker) that was successfully dropped during TD1-R3, and to accurately identify its position. 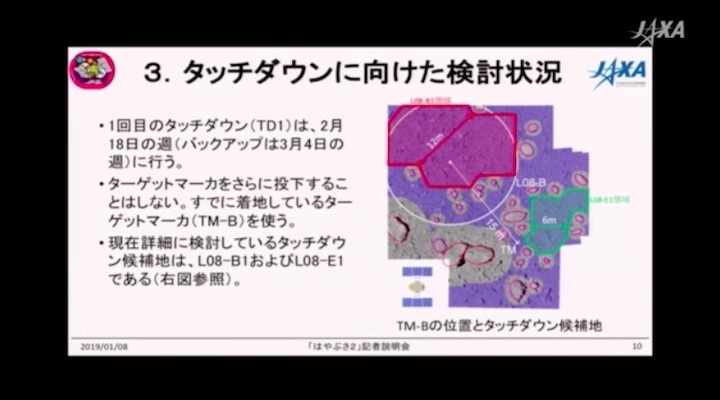 The spacecraft descended over the sub-solar point where the spacecraft, Sun and TM on the surface of Ryugu all line up. The spacecraft captured an image at an altitude of about 2.5km with the Optical Navigation Camera - Telescopic (ONC-T), and then withdrew after descending to an altitude of about 2.2 km. The result was a huge success! The retroreflective material of the TM reflected sunlight and made the TM glow in the image. 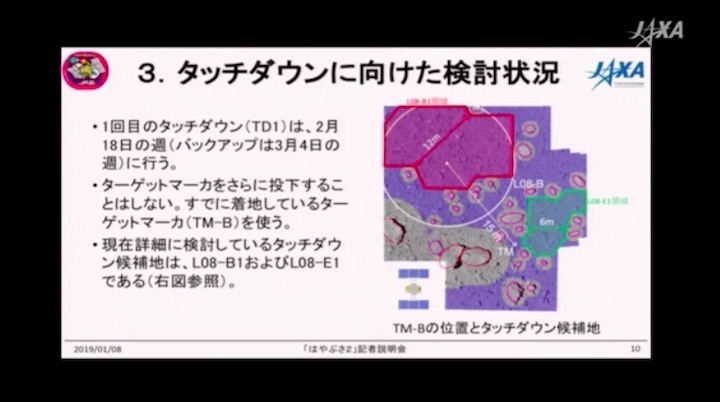 This is another step forward for the TD1 operation at the beginning of next year. The spacecraft then slowly rose to save fuel and returned to the home position on 11/5. After completing important operations such as TD1-R3 and BOX-C2, the spacecraft returned to the home position at an altitude of 20km. This week, we performed a health check for the optical navigation cameras (ONC), the thermal infrared imager (TIR) and the near infrared spectrometer (NIRS3). Although we normally image Ryugu, for these tests we changed the spacecraft attitude to intentionally remove the asteroid from the field of view and image deep space (a so-called ‘dark observation’). Observing dark deep space allows us to investigate the level of noise in the observation equipment. 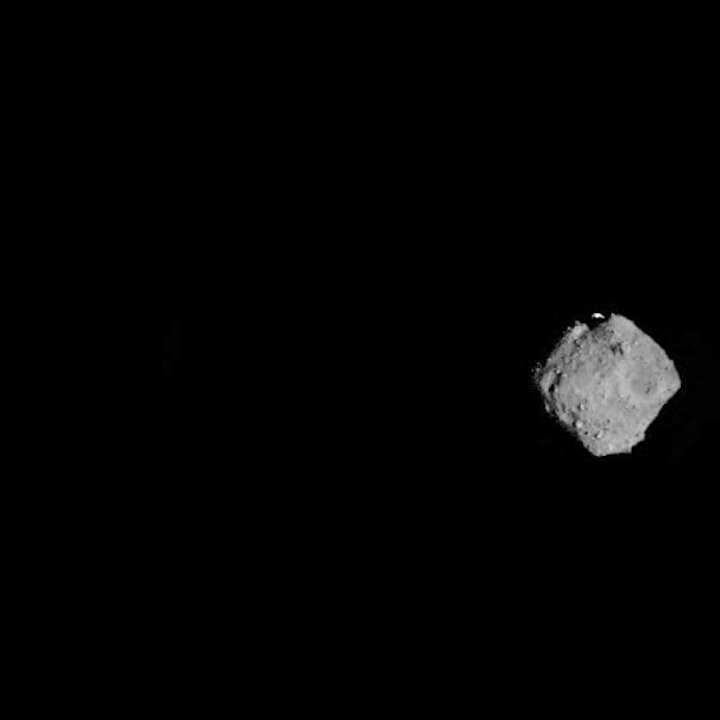 This will be the third dark observation after arriving at Ryugu. To guarantee the safety of the mission during the period of solar conjunction, the spacecraft was inserted into a “conjunction trajectory” last week on 2018.11.23. 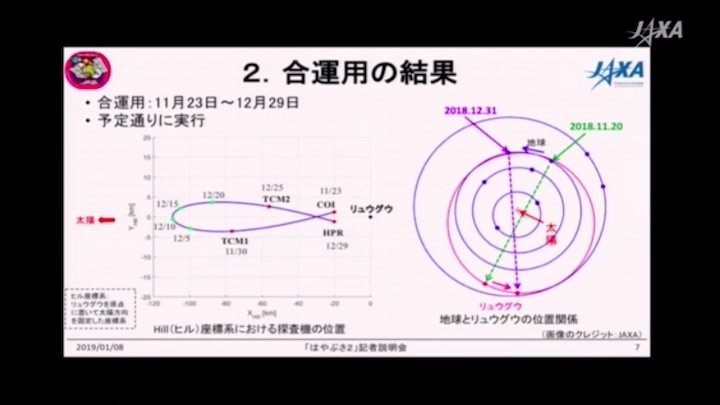 Hayabusa2 will reach its maximum distance of 110km from Ryugu on 2018.12.11 and return to the home position at an altitude of 20km on 2018.12.29. 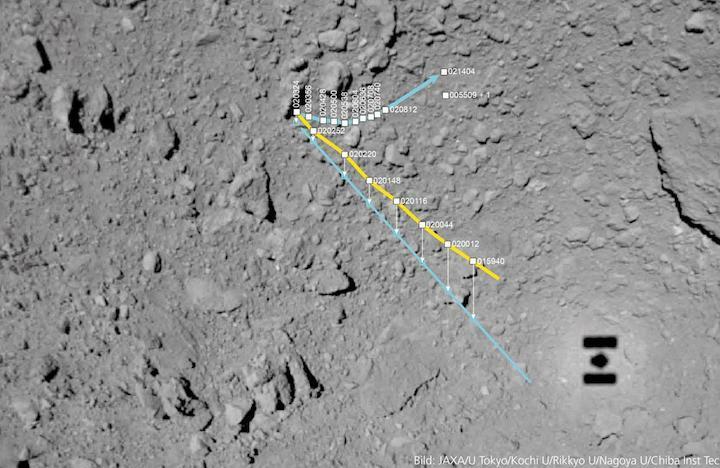 Since even small errors from the designated trajectory may result in an undesired close approach or —in the worst case— a collision with Ryugu, we have carefully measured and evaluated the spacecraft's trajectory after insertion. On 2018.11.30, Hayabusa2 reached a distance of around 75km from Ryugu and the first Trajectory Control Manoeuvre (TCM01) was performed. TCM01 was a ΔV of 3.8 mm/s given along the z-direction (towards Earth). The effect of the solar corona made the resultant ΔV difficult to assess with the two-way doppler measurement compared with past operations. Despite this difficulty, we could confirm the actual ΔV was successfully given with an estimated value of 3.77 mm/s (99.21% of the designated ΔV). Next orbital manoeuvre is scheduled after the end of the deep conjunction phase on Christmas Day (2018.12.25). During deep conjunction, only attitude manoeuvres are scheduled — one every few days— to ensure the Earth is tracked. Although it will be difficult to obtain telemetry data from the spacecraft during deep conjunction, we will take the chance to gain and accumulate valuable experience from the conjunction operation by performing radio science and communication tests. We will utilize the Ka-band capability as well as introduce “Beacon Operations” to obtain the needed minimum amount of spacecraft data on the ground. The US asteroid explorer, OSIRIS-REx, arrived at its destination, asteroid Bennu, on December 3, 2018 (U.S. time) ! Article on the OSIRIS-REx website. We sent the team an arrival celebration video letter from all of us at JAXA and the Hayabusa2 project. We are continuing operations for the solar conjunction period, and full scale “Beacon Operations” have begun. This made us realise we are approaching the deepest part of solar conjunction. When the angle between Hayabusa2 and the Sun as seen from the Earth becomes 3 degrees or less, the radio waves transmitted by the spacecraft are affected by plasma near the solar surface. As a result, the intensity of the radio field received on Earth from Hayabusa2 fluctuates greatly and the telemetry which tells us about the state of the spacecraft may not be received. In this case, the “Beacon Operations” become a powerful tool. 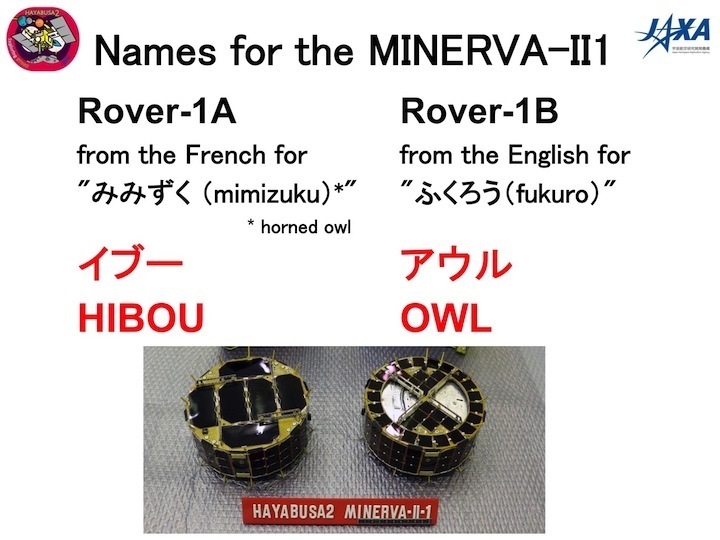 Information about whether the state of the spacecraft is normal (such as voltage and similar conditions) are represented like a binary number where the “1” and “0” are replaced by the intensity of the transmitted radio waves from Hayabusa2. Therefore, even if the received radio field intensity on Earth is changing, the “1” or “0” can still be read by eye (in fact, we also make it possible to analyse this on a computer). 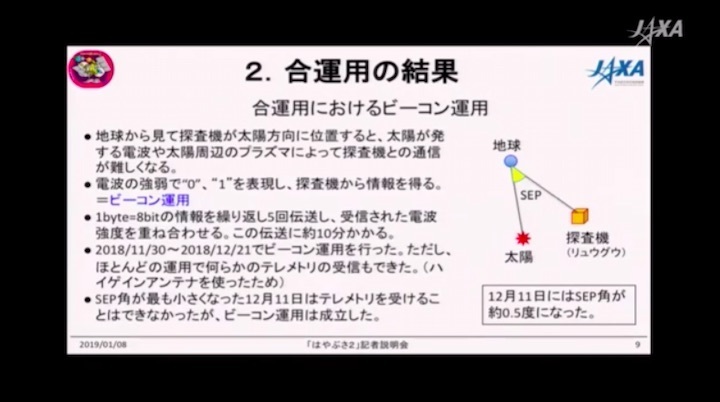 As a result, Hayabusa2 was able to communicate “I am fine”. With this, we are ready to pass through the midst of solar conjunction! In this week, we passed through the middle of solar conjunction on 12.12 and performed three pass operations (periods of connection opportunity with Hayabusa2) from the Usuda ground station and two using overseas stations. 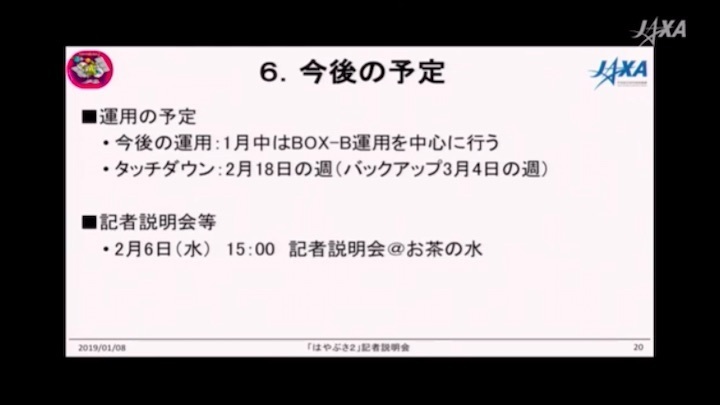 At the Usuda station, a telemetry operation was attempted after the “beacon operation”, but only three packets of data could be received. When the Sun moves in-between the spacecraft and Earth, communication is tough! From the overseas stations (Madrid and Goldstone) a ranging operation was performed that used Ka band radio waves. After this we tried to acquire telemetry, but this proved to be impossible. However, we were able to confirm that the command send from the ground reached Hayabusa2 which then operated as instructed. We have now passed through the toughest period and will be able to receive telemetry next week. From late November 2018 until the end of December, the solar conjunction operation is underway for Hayabusa2. Solar conjunction refers to the situation where the direction to the spacecraft almost overlaps with that to the Sun when viewed from the Earth. This is the same “conjunction” as in astronomy, whereby planets and stars appear to line up on the sky. During this time, communication with Hayabusa2 is disrupted due to radio waves emitted from the Sun and from its surrounding plasma. 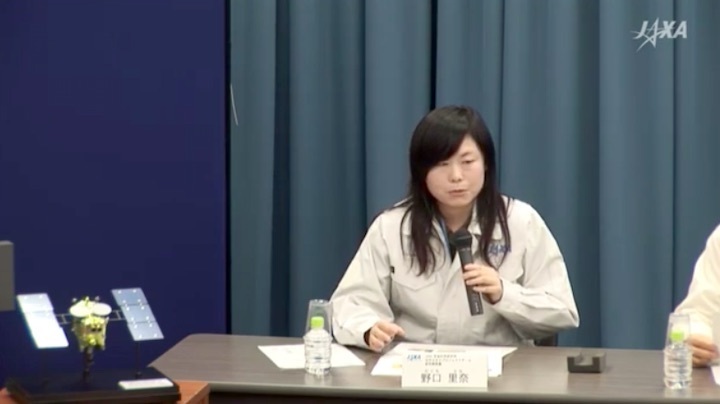 We therefore do not perform operations such as descending towards Ryugu during this period. In order not to risk a collision with Ryugu while communication is disrupted, we place the spacecraft slightly further away from the asteroid in a “conjunction transition orbit”. Figure 1 shows an animation of the trajectory of the spacecraft in the Hill coordinate system. In this coordinate system, the Sun is always to the left and outside the figure. The black dot on the right is Ryugu. From late November to the end of December, the spacecraft will travel along the blue line. The red dots are points where a trajectory control manoeuvre will be performed. 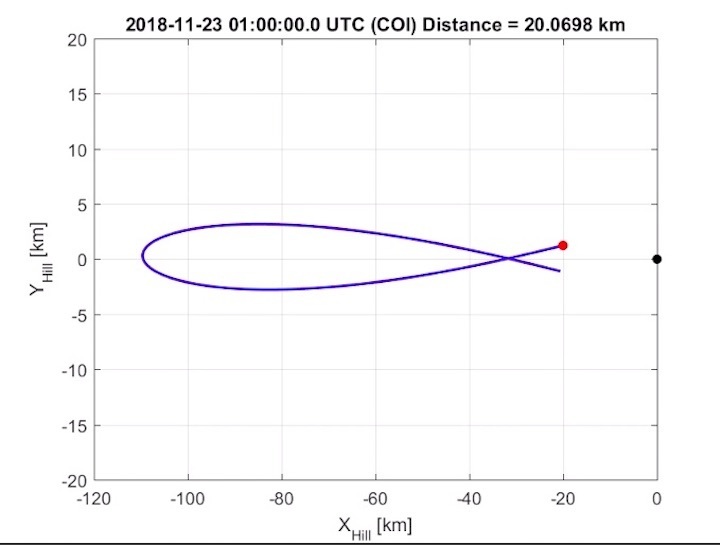 Figure 1: Spacecraft position during the conjunction transition orbit between November 23 and December 29, 2018. 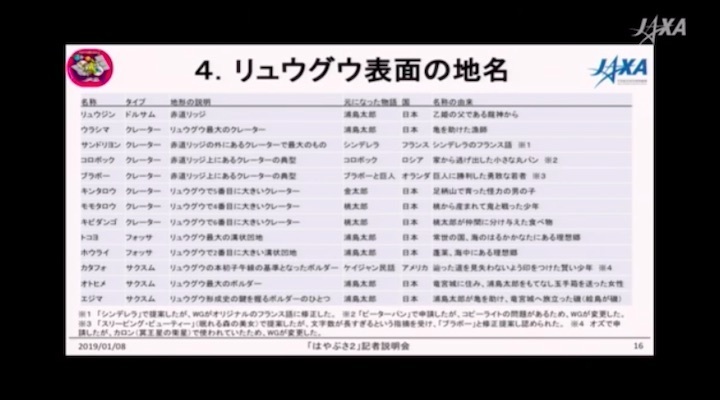 Until now, “astrodynamics” has been one of the less frequently reported operations for Hayabusa2. In space engineering, the movement, attitude, trajectory and overall handling of the flight mechanics of the spacecraft is referred to as “astrodynamics”. For example, astrodynamics played an active role in the gravity measurement descent operation in August 2018. While this was a short time ago, let’s look at a few of the details. From August 6 - 7, 2018, the “Gravity Measurement Descent Operation” was performed to estimate the strength of asteroid Ryugu’s gravity. Hayabusa2 initially descended from the home position at an altitude of 20km to an altitude of 6100m. Orbital control was then temporarily stopped to allow the spacecraft to “free-fall” towards Ryugu, moving due to the gravitational pull of the asteroid alone. When the altitude decreased to about 850m, the thrusters were instantaneously fired to give the spacecraft an upward velocity, whereupon Hayabusa2 performed a “free-rise” to an altitude of about 6100m (the spacecraft’s movement here is similar to throwing a ball vertically upwards). From the spacecraft’s motion during the free-fall and free-rise, the strength of Ryugu’s gravity could be measured and the mass of the asteroid obtained. 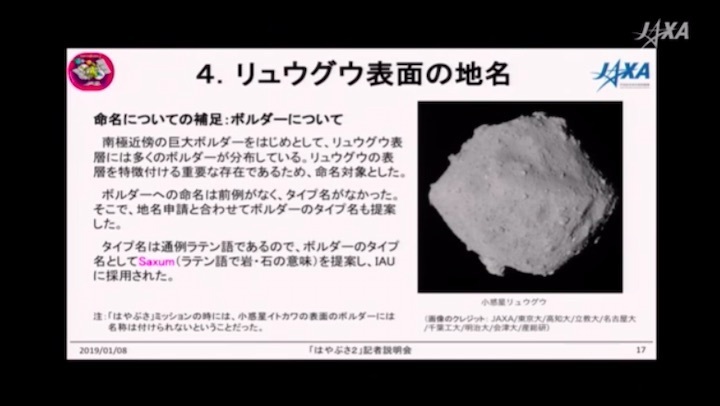 As a result of this measurement, the mass of Ryugu was calculated to be about 450 million tons. 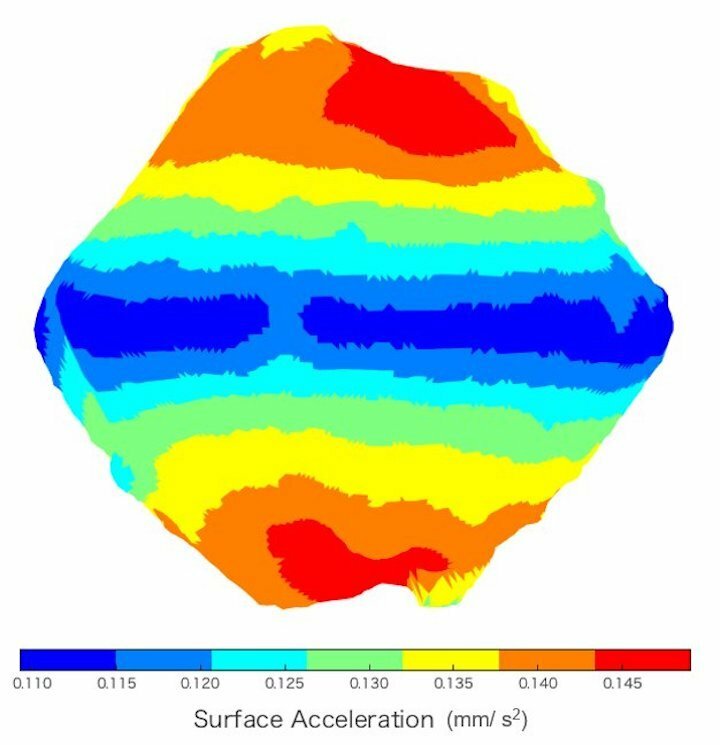 Figure 1: Distribution of the gravitational acceleration on the surface of asteroid Ryugu (image credit: JAXA). The gravitational acceleration on the surface of Ryugu is approximately 0.11~0.15 mm/s2, which is about eighty thousandths (~ 1/80000th) the strength of the Earth’s gravity and a few times stronger than that of Itokawa. We can additionally see that the gravity near the poles of Ryugu is stronger than near the asteroid’s equator. This is due to the equatorial ridge protruding from the surface. The information on the asteroid’s gravitational acceleration obtained through this method has been used for operations that approach close to the surface of Ryugu. Of course, it will also be used during touchdown. The gravity measurement descent operation described here is one application of astrodynamics. 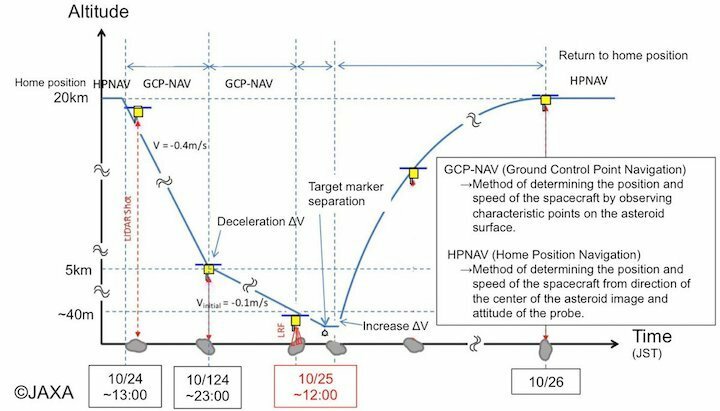 The astrodynamics team for Hayabusa2 use a variety of similar methods to estimate the trajectory of the spacecraft and Ryugu, and to evaluate the dynamic environment for operating around Ryugu. The Japan Aerospace Exploration Agency (JAXA) is searching for a suitable site on the Ryugu asteroid that it can safely land its Hayabusa2 spacecraft as early as late this month. The space agency had to abandon its first touchdown attempt that had been scheduled for late last October due to a rockier than expected surface. Last September and October, JAXA conducted a total of three landing rehearsals on potential sites. 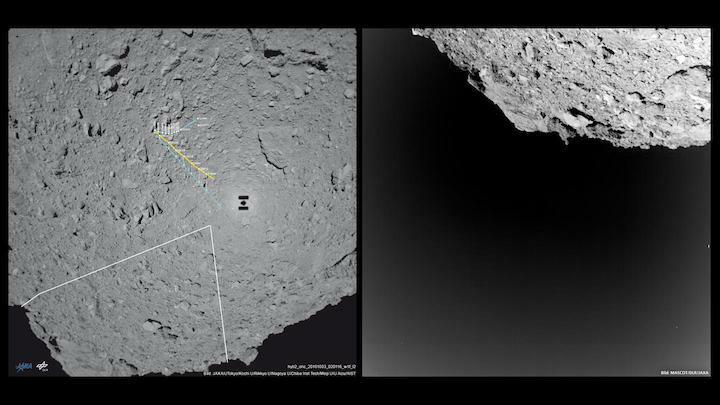 During the rehearsals, the agency succeeded in lowering Hayabusa2 to a point 12 meters above Ryugu’s surface through the use of laser sensors that allowed to the craft to autonomously control its positioning. 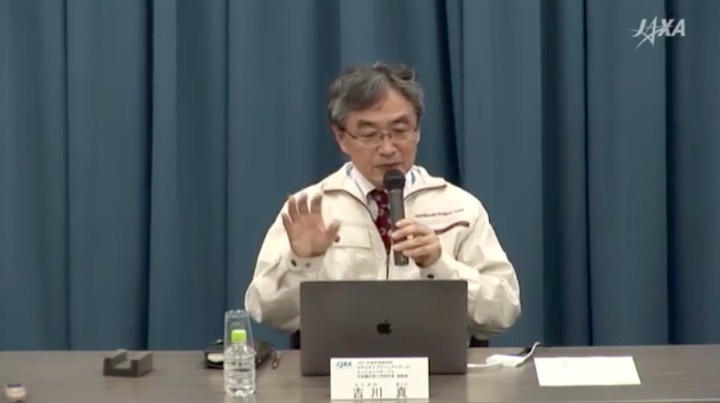 “We’ve got to the point where the only thing left for us to do is make a landing, so we’re fully prepared in terms of technique,” said Yuichi Tsuda, Hayabusa2’s project manager. 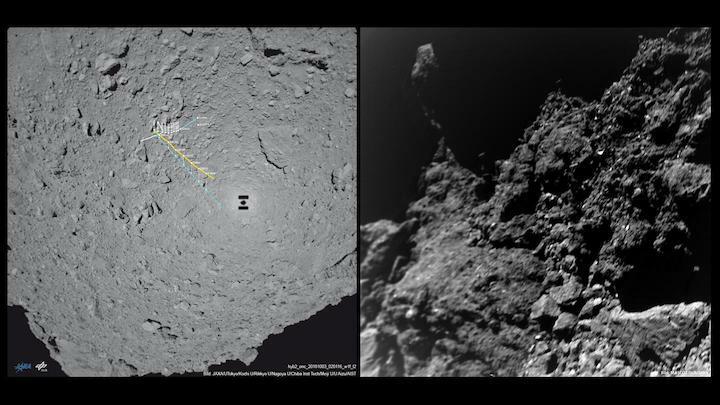 Hayabusa2 will use a 1-meter-long cylindrical device to collect samples from Ryugu, which will be deployed on the asteroid when the craft touches down. For a safe touchdown, it is necessary that there are no rocks bigger than 50-70 centimeters high around the landing site. “At the moment, we can’t guarantee a perfect landing,” Tsuda said. A JAXA team aims to reduce the chance of an error by improving Hayabusa2’s autonomous control program based on its movements during the rehearsals. The team is working to find the safest location by estimating the heights of nearly 100 rocks based on the lengths of their shadows. 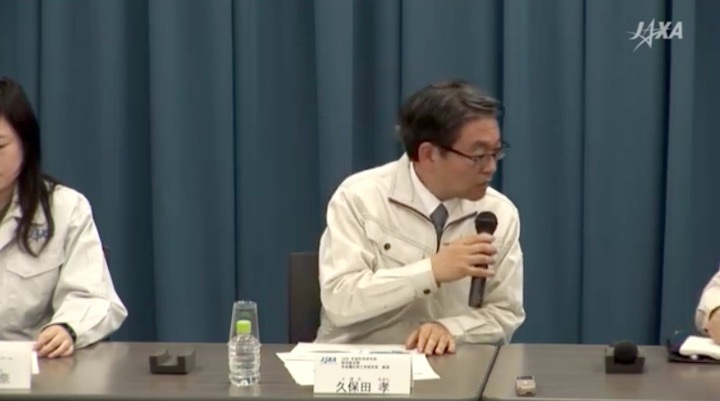 JAXA Pressekonferenz Reporterbriefing zum Asteroidenforscher "Hayabusa 2"
Derzeit fliegt der Asteroidenforscher "Hayabusa 2" etwa 40 km vom Asteroiden Ryugu (Ryugu) entfernt. 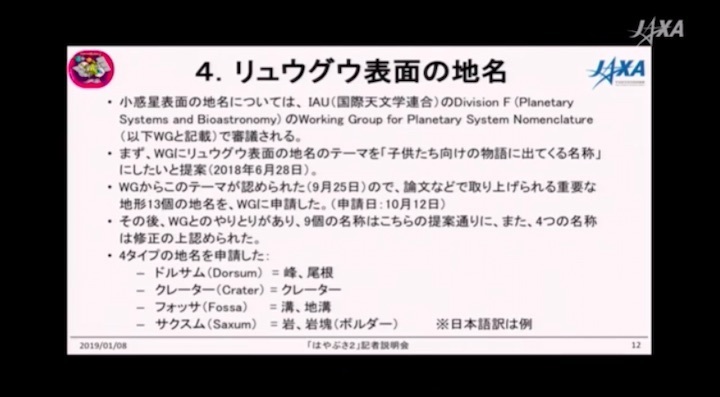 Bei dieser Informationsveranstaltung wird die aktuelle Situation von "Hayabusa 2", und die Funktionsweise der gemeinsamen Operation und den Status der Bewerbung für den geografischen Namen der Internationalen Astronomischen Union von Ryugu erläutert. JAXA Space Science Institute Projektteam "Hayabusa 2"
The Hayabusa 2 spacecraft is expected to land on the “spinning top” asteroid Ryugu in February in a mission that could provide clues on how the solar system was formed. The first landing was initially planned for October, but the Japan Aerospace Exploration Agency (JAXA) delayed the attempt because of the asteroid’s rockier-than-expected surface. The two sites are near the equator of the asteroid. 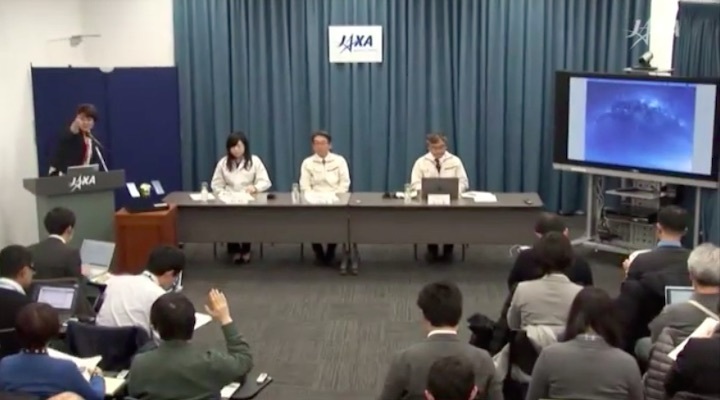 JAXA said it will pick one by early February. Between Feb. 18 and Feb. 23, the Hayabusa 2 will start descending from its “home position” at an altitude of 20 kilometers from the asteroid. 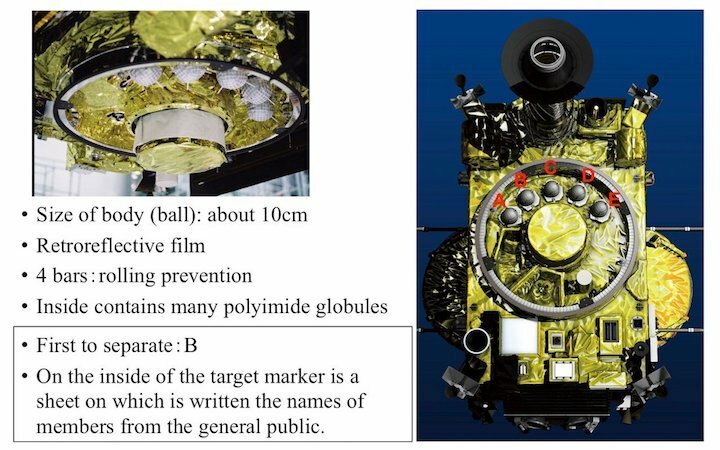 JAXA will use “target markers,” which will be dropped on Ryugu beforehand, to guide the probe. Hayabusa 2 is scheduled to make three touch-and-go landings. On the first landing, which will last for a few seconds, a 1-meter-long cylindrical device called Samper Horn will extend from the probe and fire a bullet into the asteroid. The Hayabusa 2 will collect the sand and rock fragments emitted before returning to the home position, according to JAXA. Ryugu is believed to have been created 4.6 billion years ago, when the solar system was formed. The samples could help explain the origins of the solar system and even life on Earth, particularly if they contain organic substances or water. ”We will carry out the mission carefully yet daringly,” Kubota said. 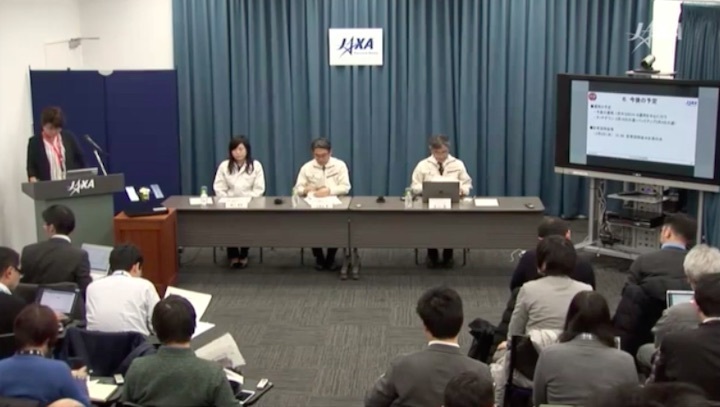 JAXA also said the International Astronomical Union has recognized 13 names of locations on the asteroid that JAXA had submitted for approval. 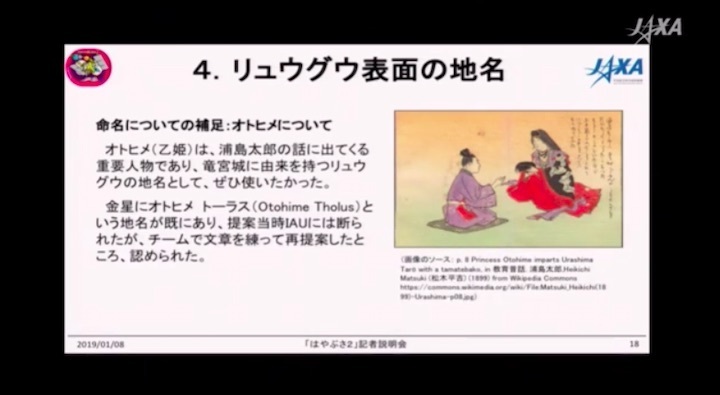 The names include characters in Japanese traditional folk tales, such as “Urashima” and “Otohime,” a fisherman and princess, respectively, in “Urashima Taro,” and “Momotaro,” the hero in “Momotaro” (Peach Boy).